This week, with holidays well underway, it seemed the perfect opportunity to share the image above, Ettalong Beach. The image above provides a snapshot on the history of a holiday destination which has long been popular with Australians looking for a little sun. Even in the colder winter weather, many will still head to beach resorts, like Ettalong, these July school holidays. Ettalong Beach has been known for almost as long as European colonists have been in Australia with Governor Phillip visiting the Central Coast and stopping at Ettalong Beach in 1788 and again in 1789. At the time of this first visit, it was noted that there were a large number of Aboriginal people on the beach and in the surrounding area, but this population was quickly decimated by European diseases, particularly smallpox. The first European to permanently settle in the area was James Webb, who took up a formal grant of land in 1824, a grant which eventually grew to include most of the Woy Woy area. Other early Europeans in the area were men who collected and burned the huge number of shells to be found in the Ettalong and Woy Woy areas. These burned shells provided the lime necessary to build the colony. Still other settlers were boat builders, who used the Brisbane Water area to build and launch hundreds of boat between 1829 and the decline of the shipbuilding industry in the area in the 1950s. Then, in the 1880s, the railway was extended to the Central Coast. By 1888 Woy Woy had its own railway station and by the 1890s, the Central Coast was something of a tourist wonderland. Woy Woy and the nearby Ettalong Beach became known for fishing, oysters, boating, picnicking and bathing, and people came from far and wide to enjoy the seaside resorts. 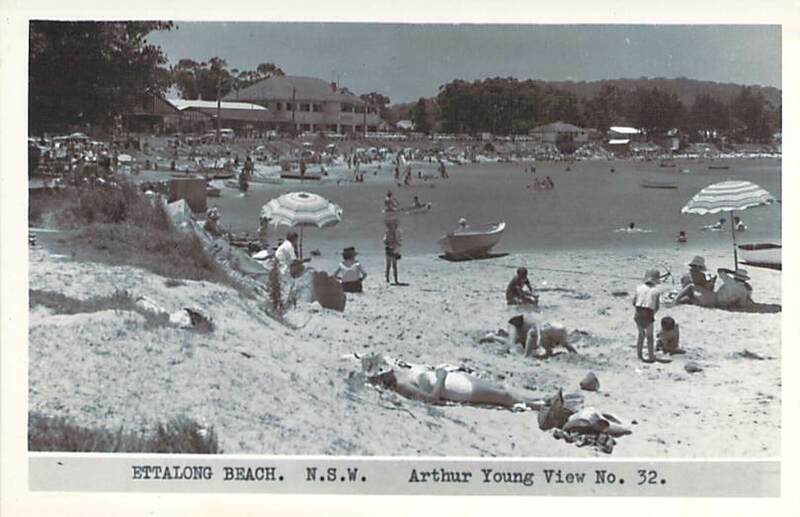 Boarding houses, hotels and pubs began to spring up, and even seaside theatres were built at Ettalong, Woy Woy and Avoca. The main attraction though was, of course, the beach itself and Ettalong in particular was known for its beautiful beach. This entry was posted in Central Coast, New South Wales and tagged beaches, entertainment, exploration, history, holiday, holidays, leisure, postcard collection, tourism.